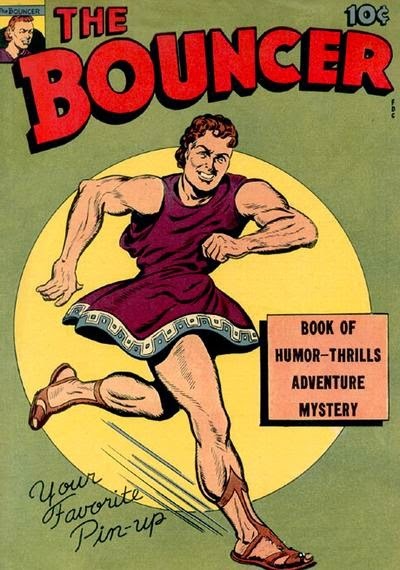 and it's basically when I find a comic or a story or a cover that just seems so WEIRD I have to post it for you. 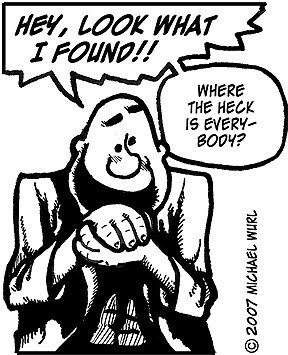 Today's story features MAGNO and DAVEY. 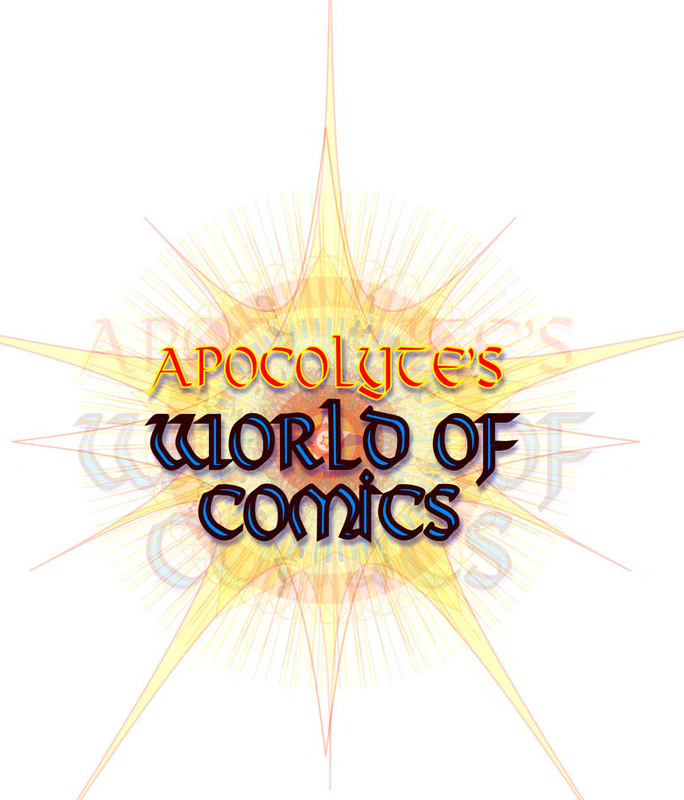 They were the stars of ACE COMICS most popular title, SUPER-MYSTERY COMICS. 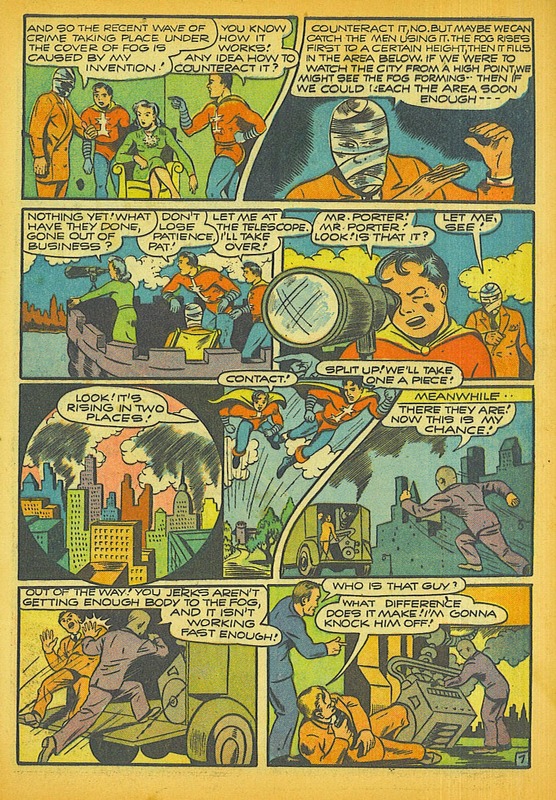 MAGNO debuted in SUPER-MYSTERY COMICS #1, July 1940, and DAVEY appeared and became his kid sidekick (everybody had one back then) in issue #4. 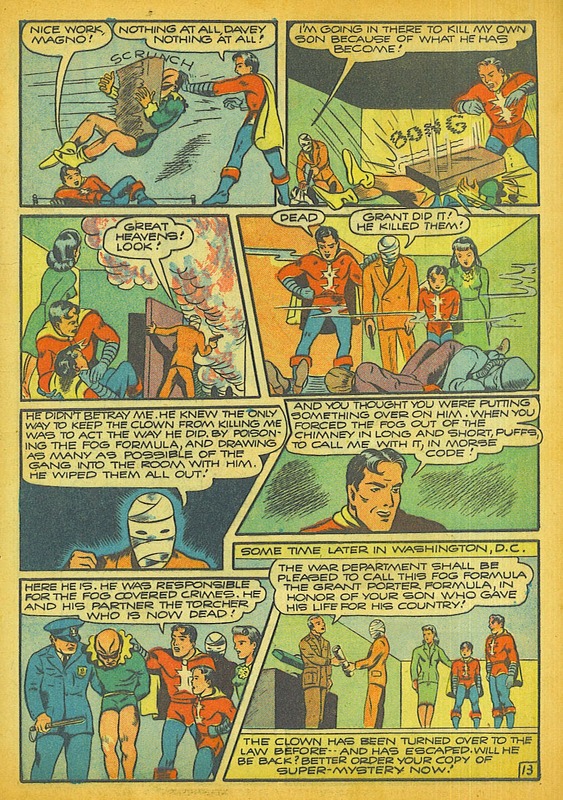 As his name implies, MAGNO's powers were magnetic in nature, in a typically pseudo-science fiction comic book manner. 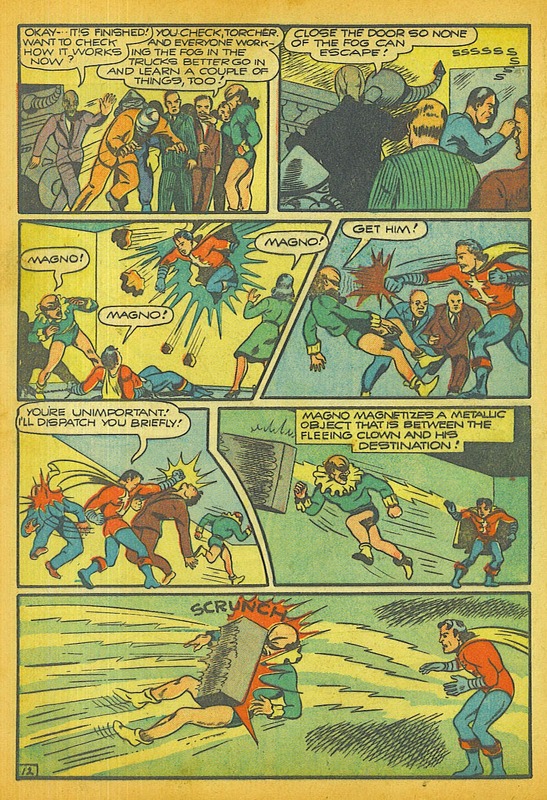 MAGNO could apparently magnetize any object at will and thereby control it. 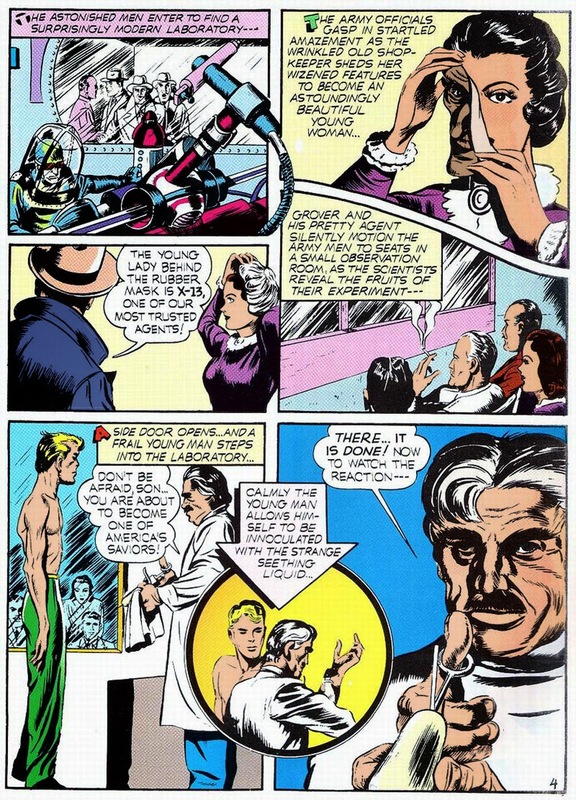 It was in this manner he attained the power of flight. If he wanted to go to the city library, for example, all he had to do was (somehow) magnetize himself to the library, and he was drawn there in an instant. 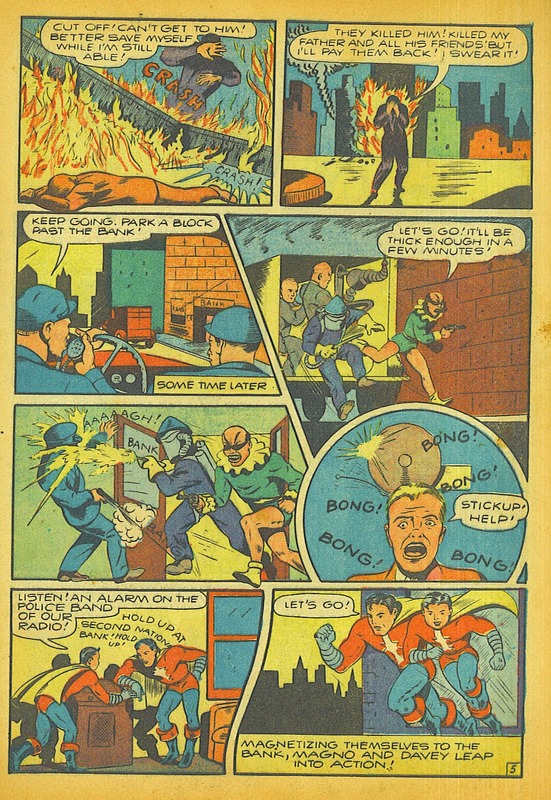 Davey was an ordinary kid who acquired his magnet powers via MAGNO just deciding to "magnetize" him, though DAVEY's powers did wear off after a certain time period and would need to be re-charged by MAGNO. 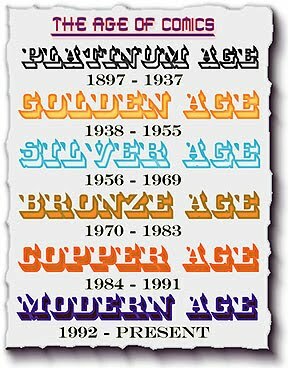 ACE employed several artists who would later become more well known, artists like Harvey Kurtzman, Dave Berg, and Jim Mooney, for example.Our story was drawn by Lou Ferstadt. 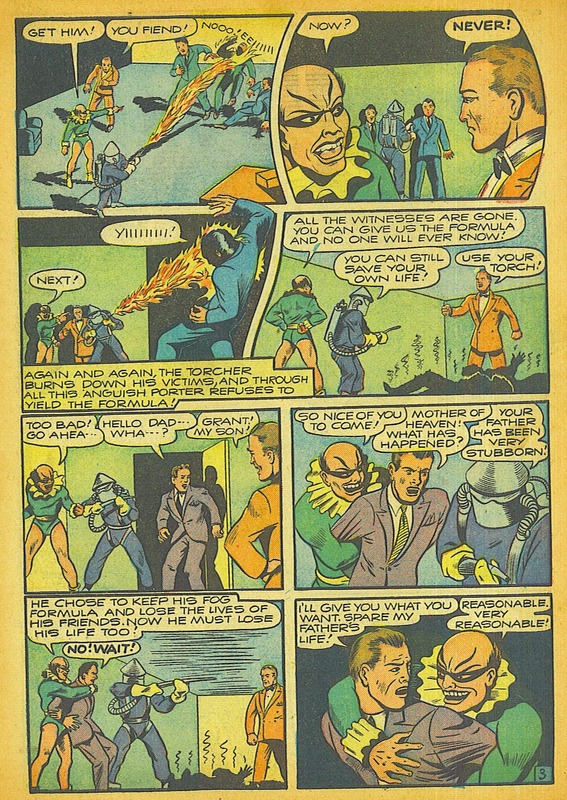 Ferstadt was a muralist and a comic book artist whose claims to fame include co-creating this WEIRD comic book character, THE BOUNCER. 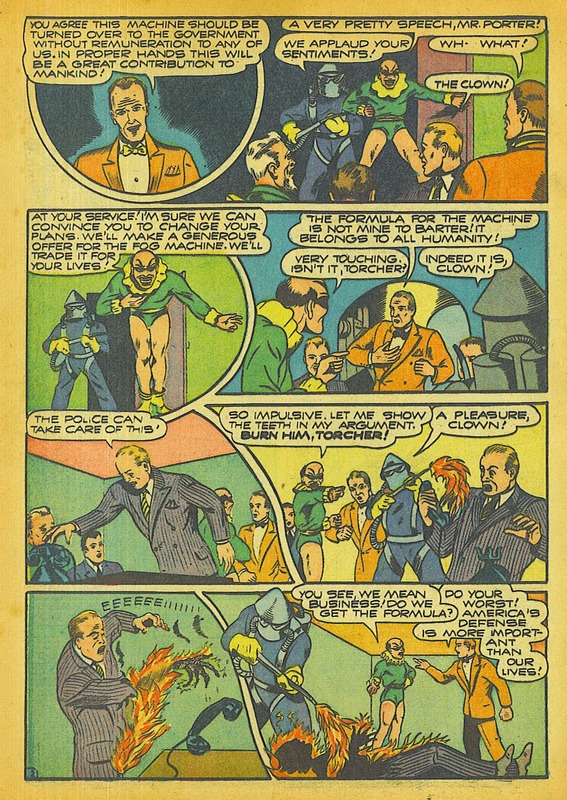 was drawn NOT by Ferstadt, but artist E.C. Stoner. 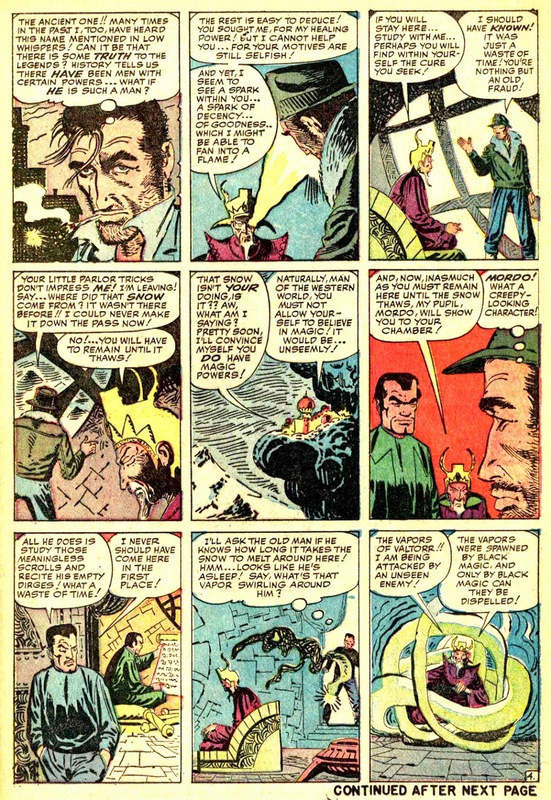 By today's standards, the art here by Ferstadt comes off as, well, weird. 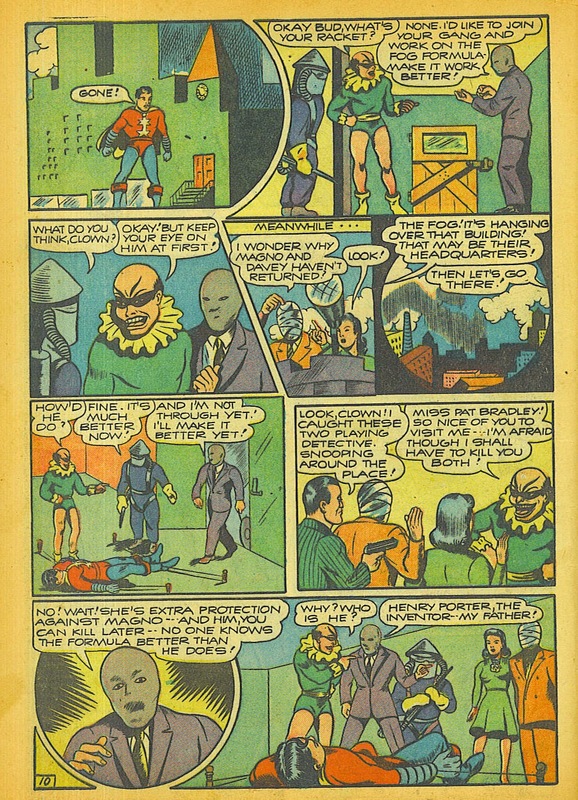 MAGNO's chief villain was THE CLOWN, a creepy character who appears to be a distant cousin to the Batman's JOKER. 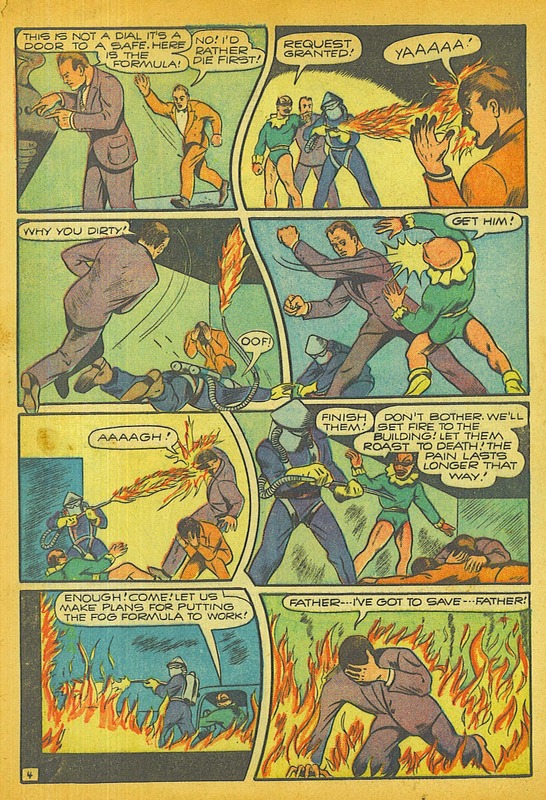 The Clown is aided by some other weird villains, one of whom enjoys roasting his victims to a crisp with a flame-thrower in various decidedly violent pre-code scenes. 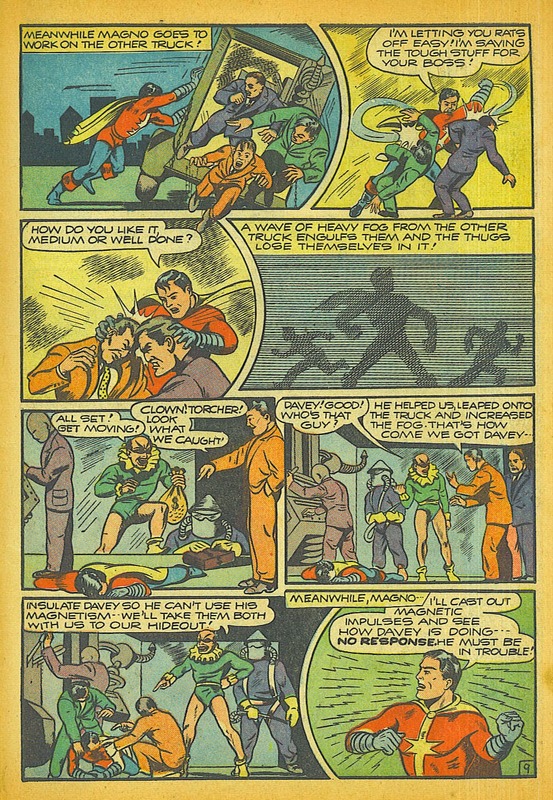 The story comes from SUPER-MYSTERY COMICS (Vol.3) #5, 1943. 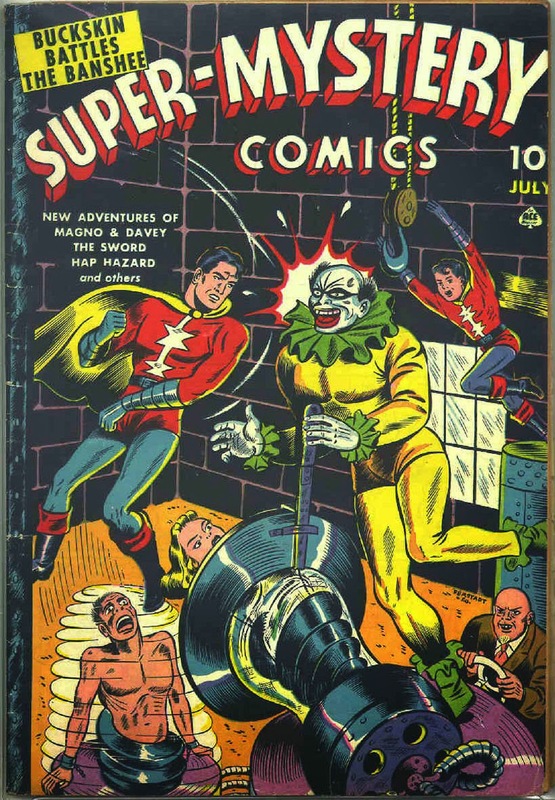 If someone can figure out what the weird villains are trying to do in this weird cover, you get bonus points. 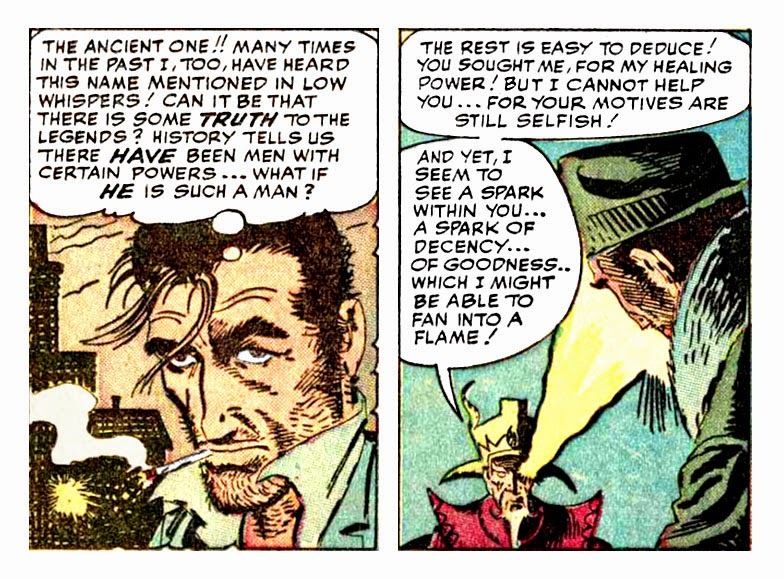 the "Marvel Age" of comics was in it's infancy. 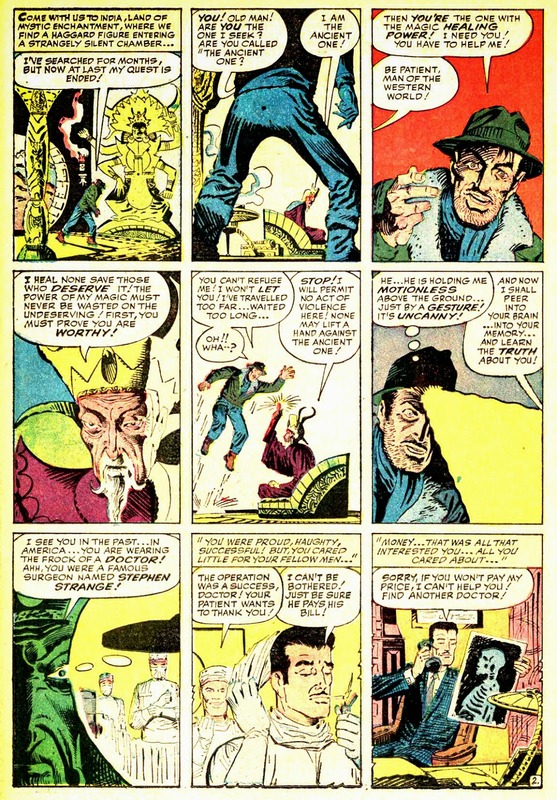 Stan Lee, aided ably by Jack Kirby and to a lesser degree Steve Ditko, had picked up the superhero ball more recently owned by DC and ran with it. 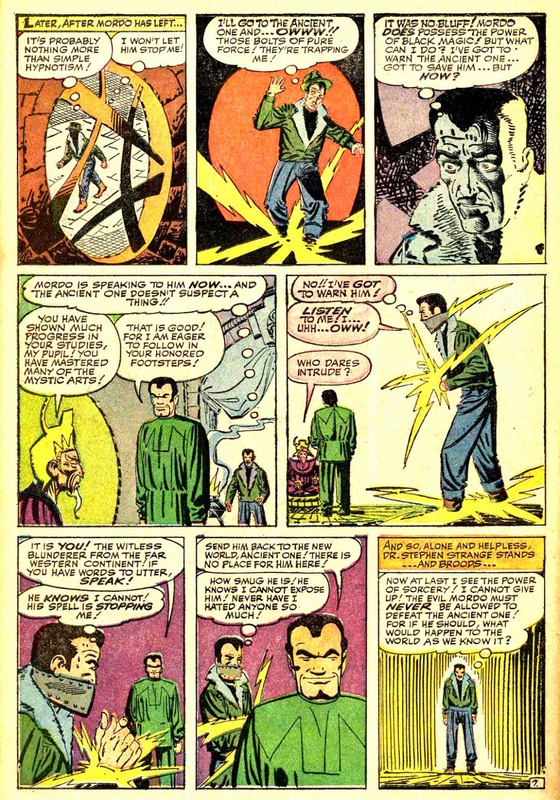 Spurred by publisher Martin Goodman, Lee had remolded the "super-team" model offered by National's Justice League Of America and with Kirby developed the Fantastic Four in late 1961, complete with an updated version of one of Marvel's most popular Golden Age characters, the Human Torch. 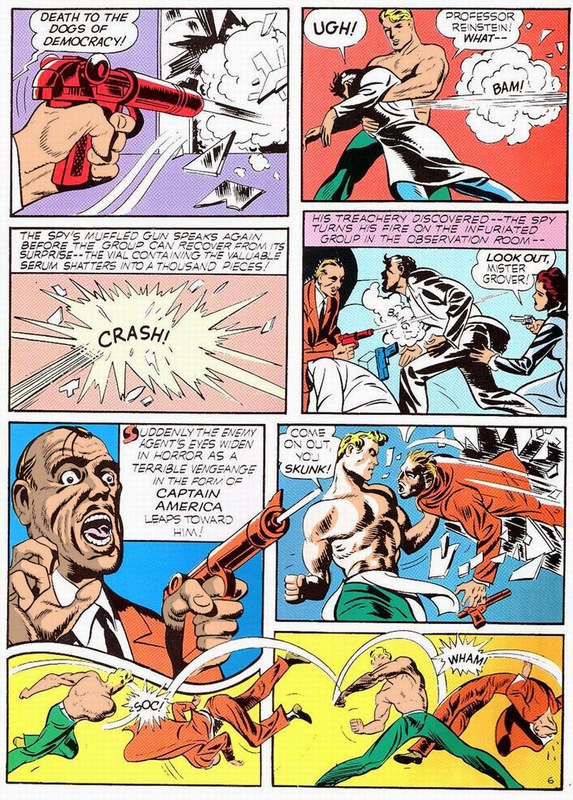 Soon after, in 1962, Marvel brought forth Hank Pym (the Ant-Man), followed by the Hulk, then Spider-Man, and Thor. 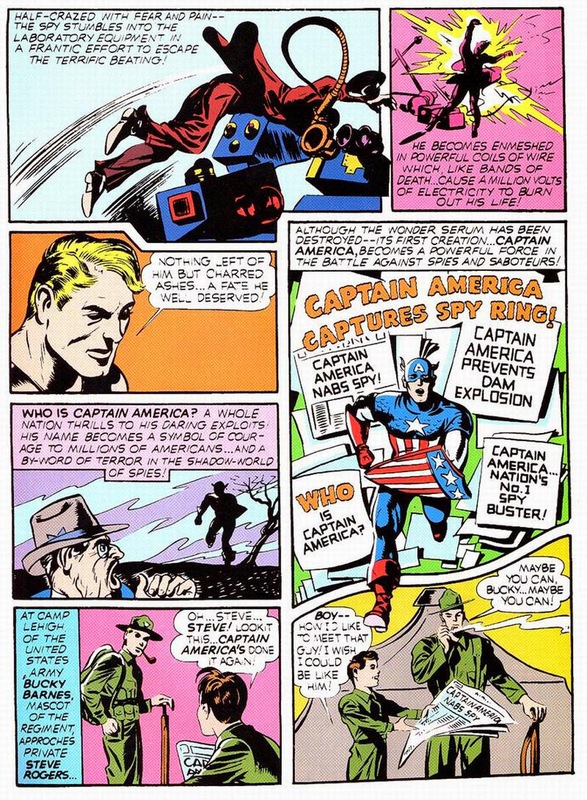 1963 saw the creativity continue, first with Iron Man, then Sgt. 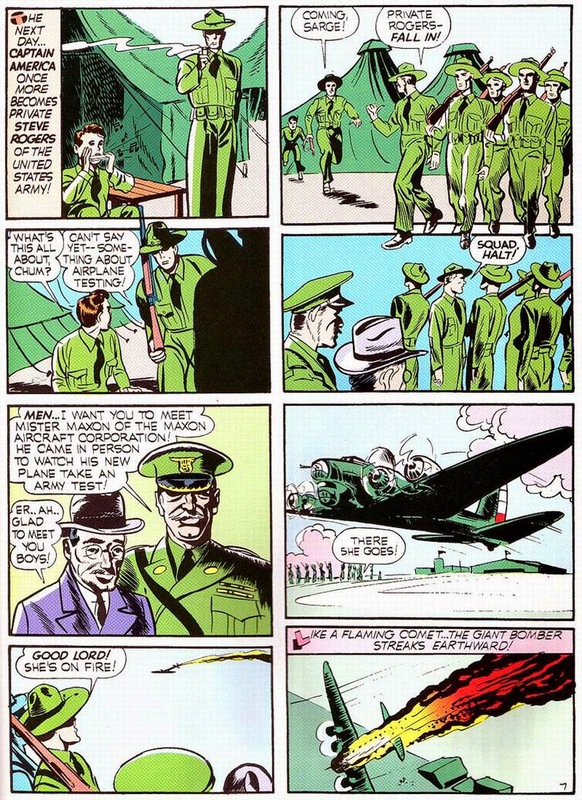 Fury & His Howling Commandos. 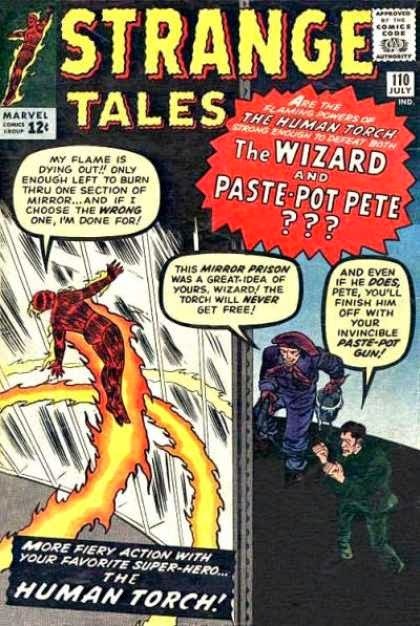 By this time Stan Lee had taken the FF's Human Torch and given the character even more exposure by having him star in Strange Tales. 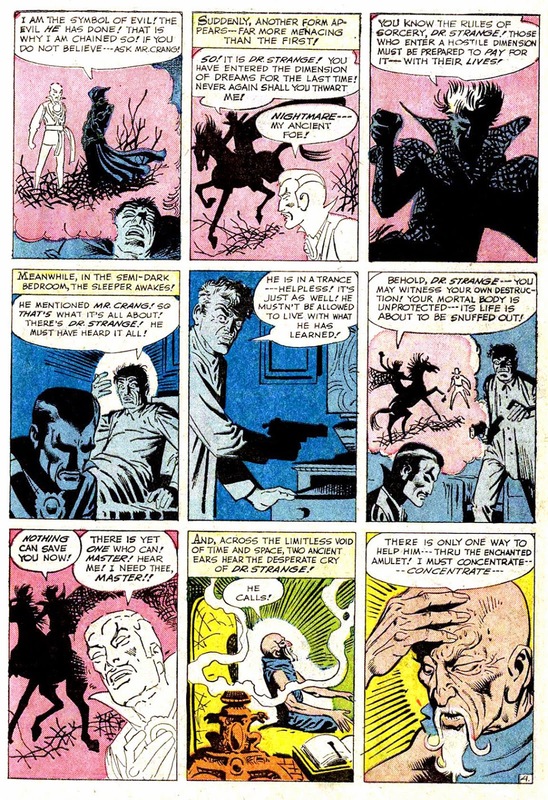 Lee hoped to revitalize the monster anthology, whose sales were waning, and he counted on the revamped Carl Burgos character to boost comic sales as it had in previous decades. 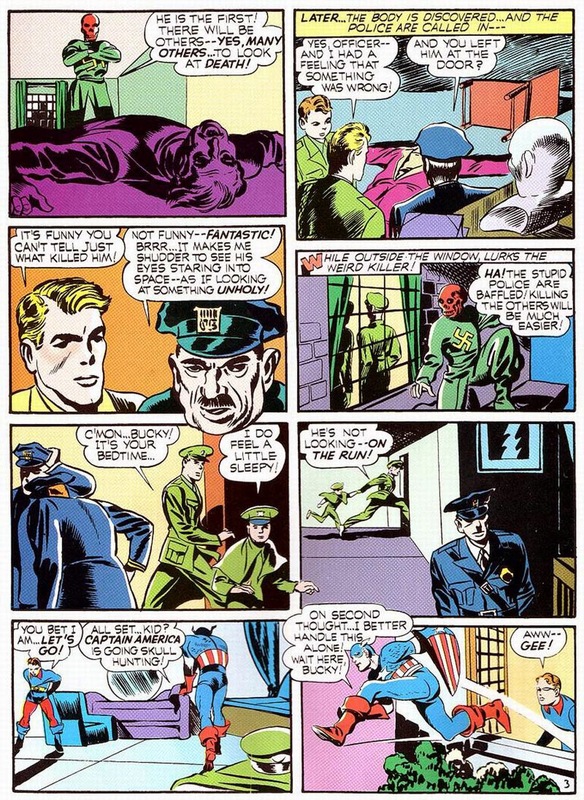 Unfortunately, artist Kirby was already taking on the lion's share of the art chores for Marvel, and drawing a full-length Torch comic wasn't a possibility. 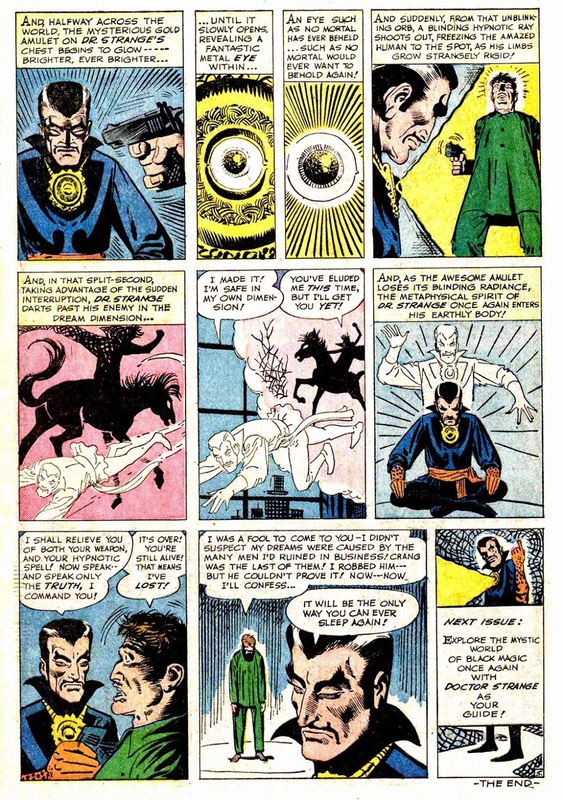 Also, the once popular monster tales weren't a good match for the new super-hero themed Strange Tales. 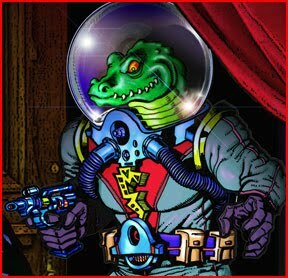 It seemed the time was right for another new character. 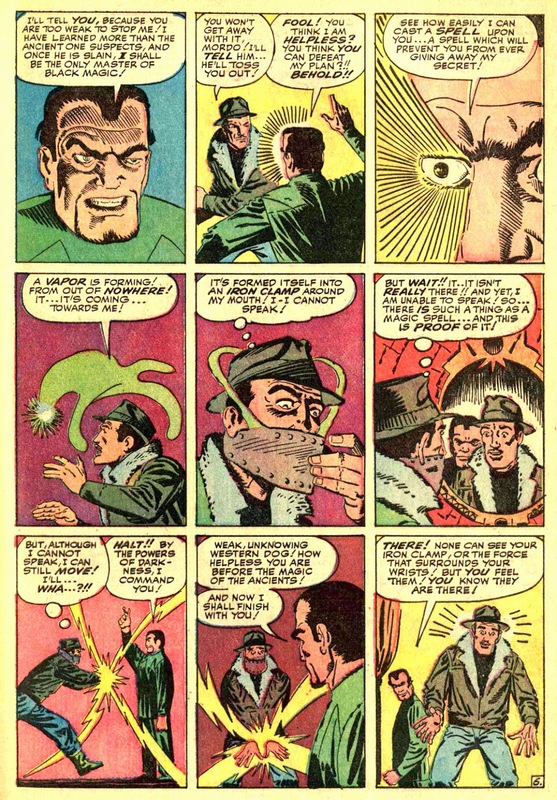 Lee tapped Spider-Man artist Steve Ditko for the new character, a magician. Did I say a magician? 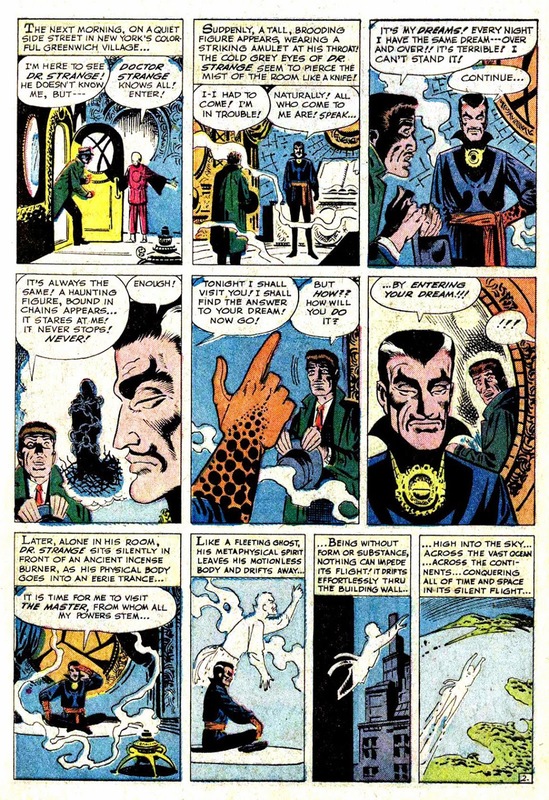 Nay, not just a mere magician, a sorceror supreme! 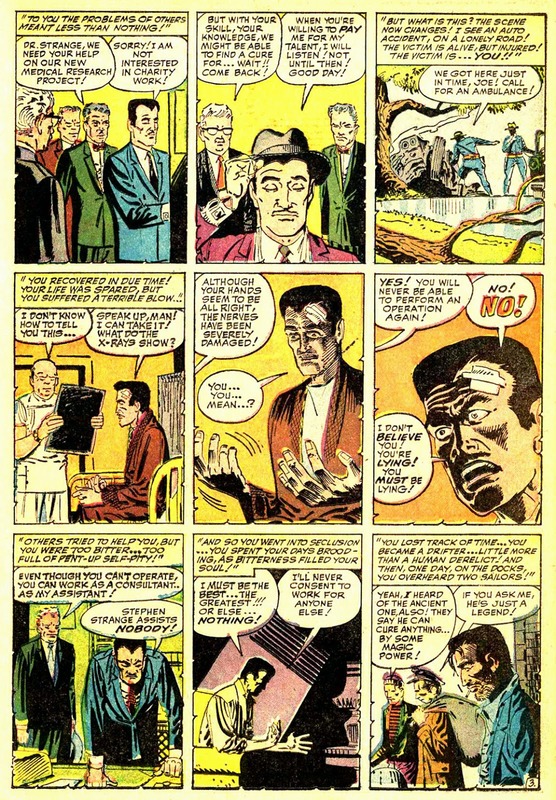 Stan Lee based his new character Dr. 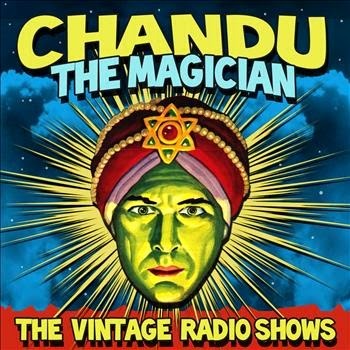 Strange (er, no relation to Golden Age hero Doc Strange...er) on magician heroes from the radio and pulps of his youth, primarily on Chandu The Magician, whose radio exploits were heard by Lee growing up. 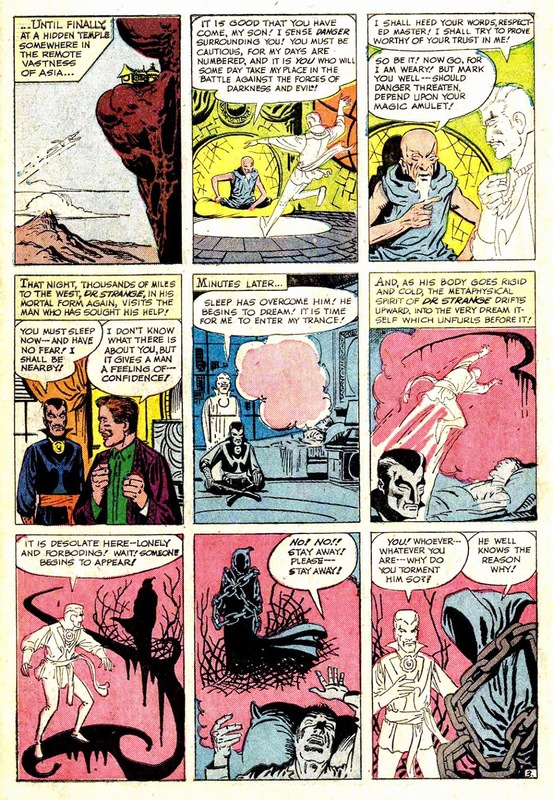 Steve Ditko was the perfect choice to draw the new adventures. 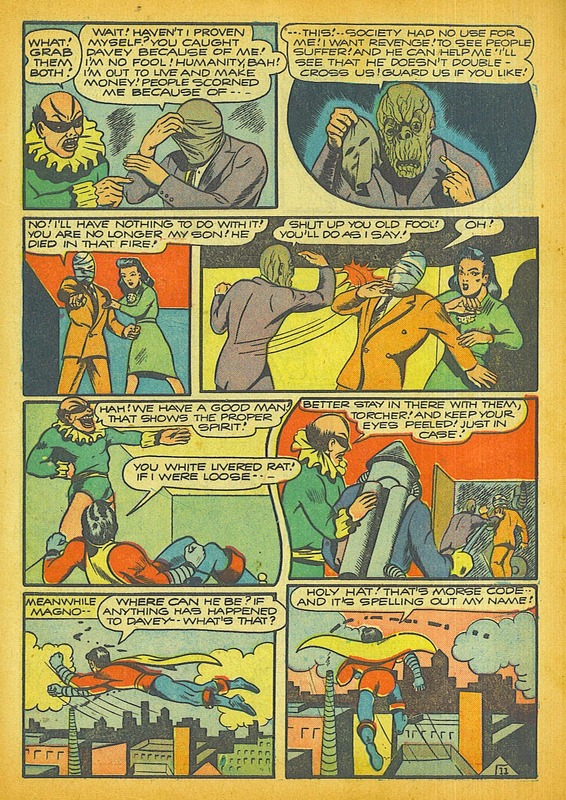 His already slightly odd figures and landscapes took on a whole new aspect of, well, strange. 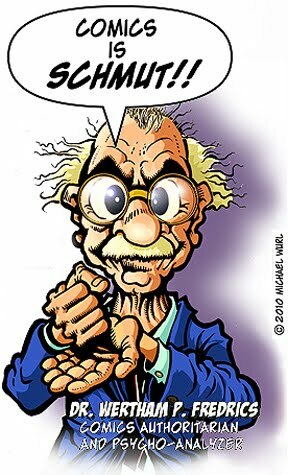 It wouldn't be long before Dr. 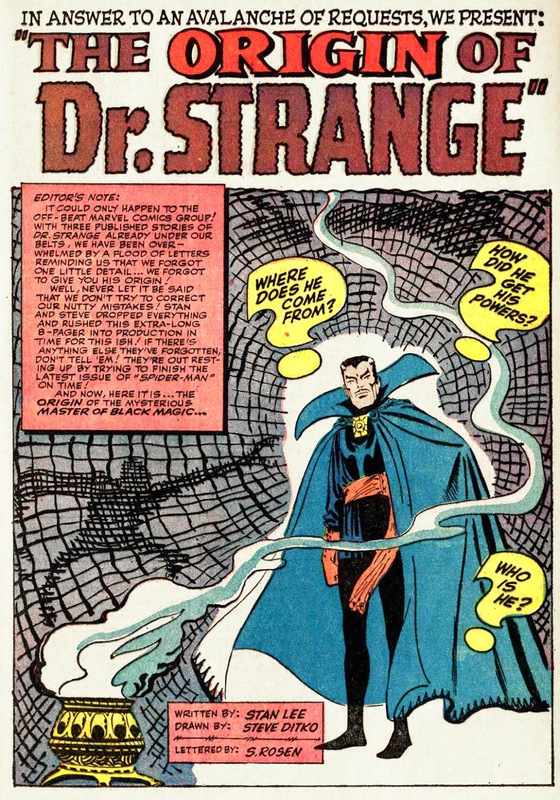 Strange became the comic book hero of choice on college campuses throughout the country, as young minds perused the pages with heightened interest, searching out hidden meanings and mind-expanding truths in the eastern mysticism laden panels. 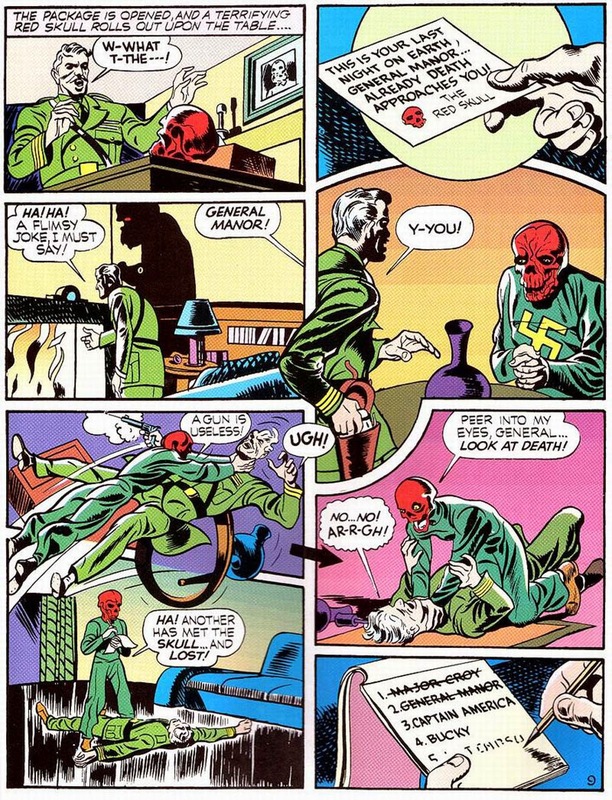 In an ironic twist, it seems that the Mighty Marvel Revolution coincided with the Drug Revolution, and it turns out that Dr. 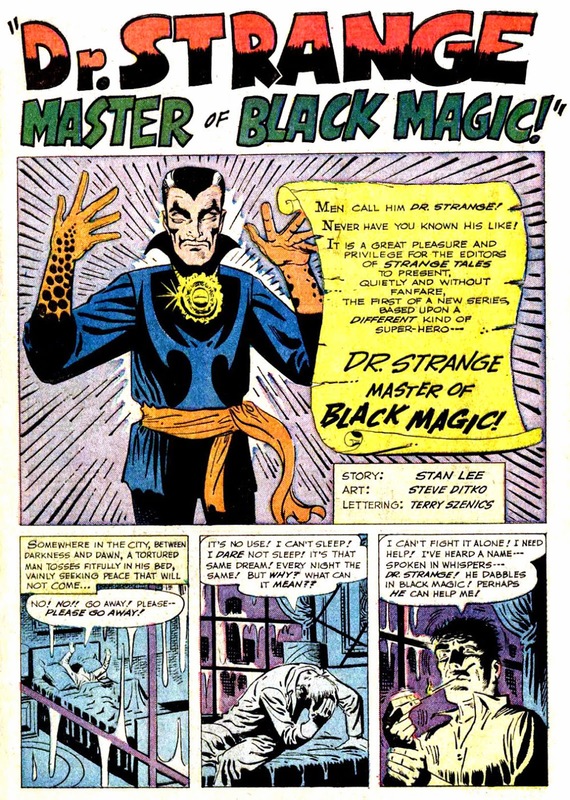 Strange became a favorite of hippies and stoners as the decade progressed, and the psychedelic style of artwork put Dr. 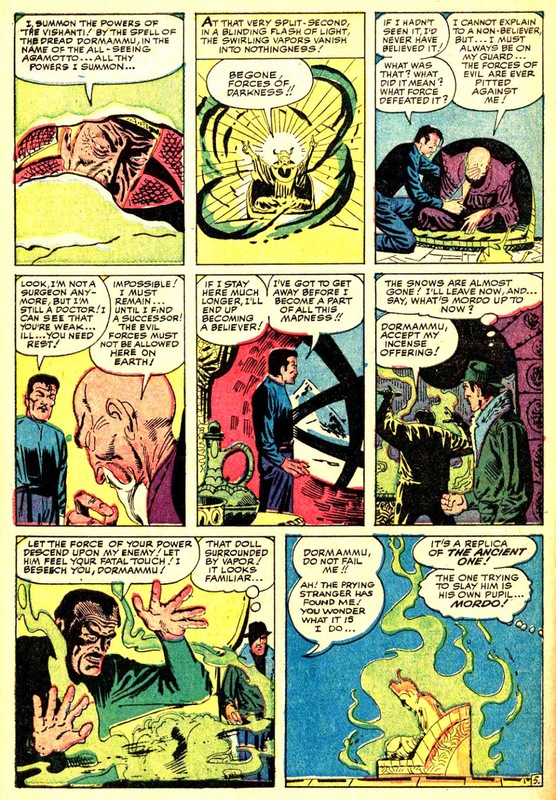 Strange and Strange Tales among those at the forefront of the movement. 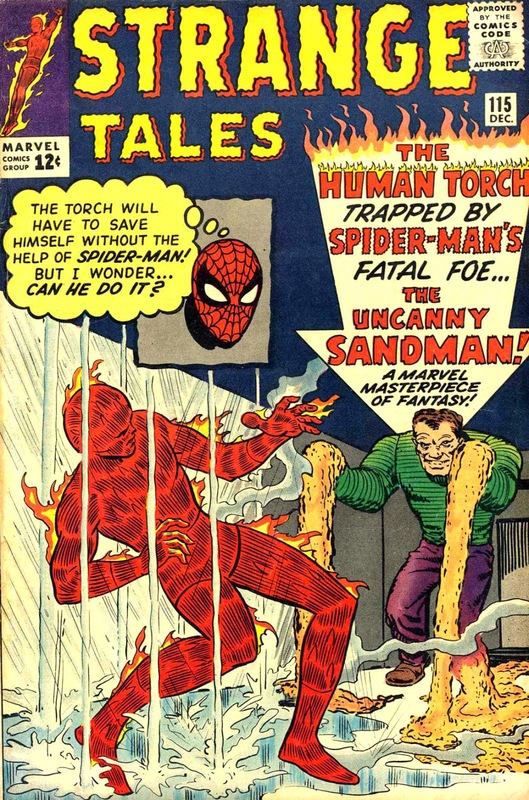 So, starting with Strange Tales # 110, 1963, the Human Torch had a new co-star. Dr. 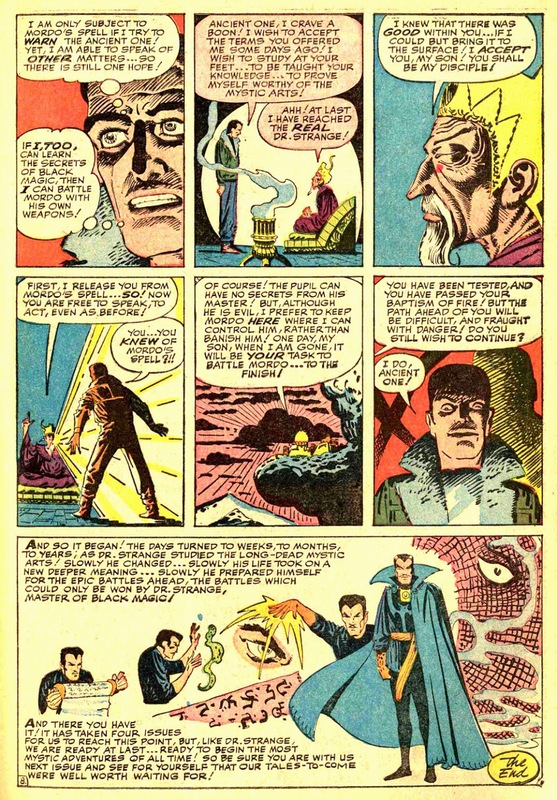 Strange was introduced fully formed, and it wasn't until issue #115 that Marvel presented an origin story. 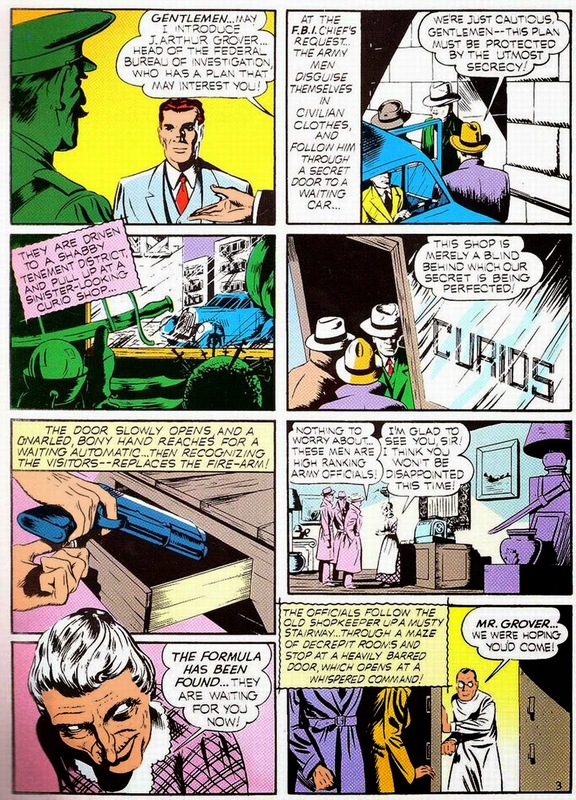 Here are both of those early stories. 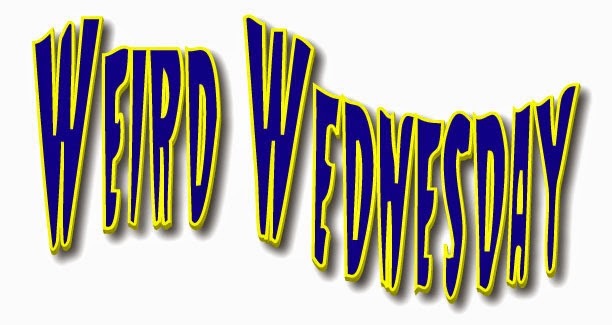 is reportedly the #1 box office draw. 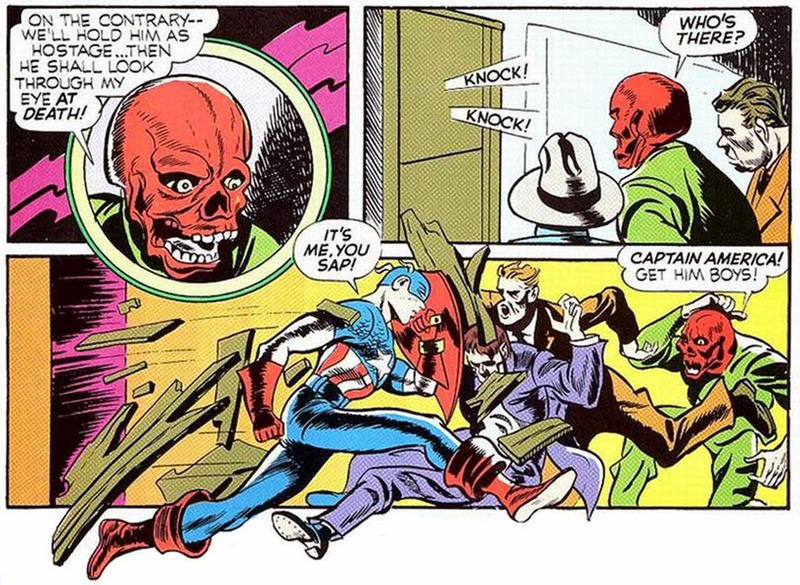 At seventy-three years old, Captain America is still going strong and shows no signs of stopping. 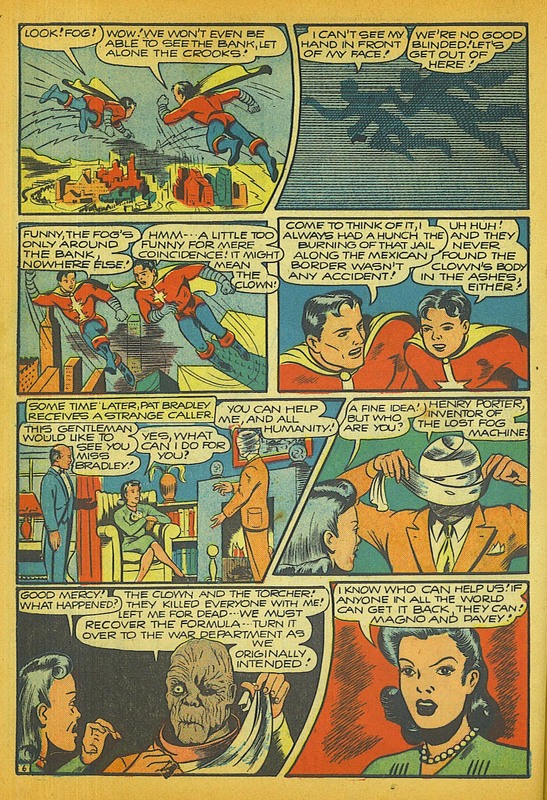 Realistically, much has changed since that first issue dated March, 1941, and the symbolic hero has endured many permutations over the years. 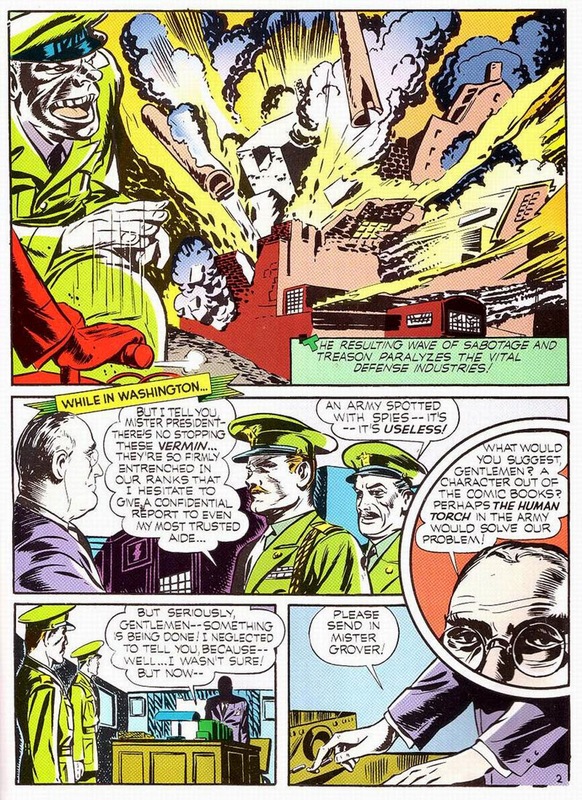 That is natural, since the country he represents has itself transmogrified over the decades, shedding layers upon layers of innocence, and allowing the once gleaming luster of patriotism to tarnish from abuse and a lack of trust in authority. 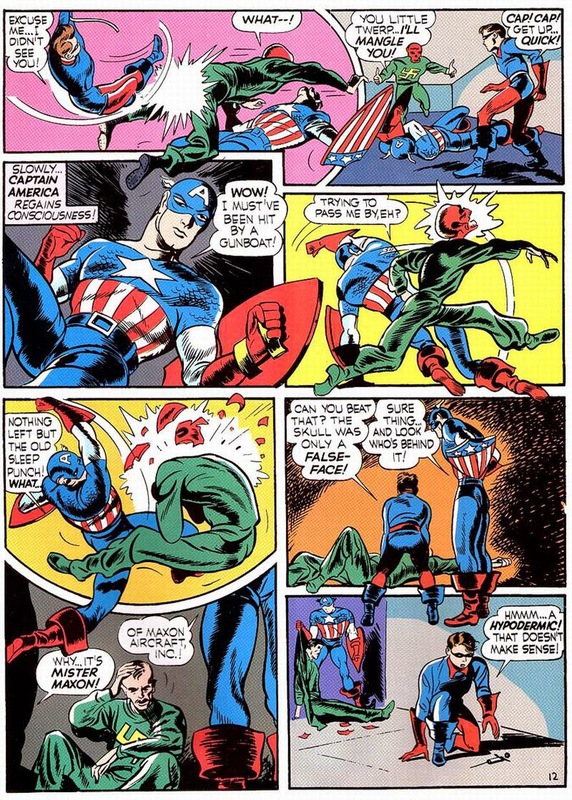 When Captain America came upon the scene those long years ago, there was a need for something to believe in, someone to look up to.There was war rumbling in Europe and the tremors were being felt in the United States of America. Economic depression had gripped the nation over a decade earlier, and the citizens were hungry for something hopeful around the next corner. Enter Joe Simon and Jacob Kurtzberg. 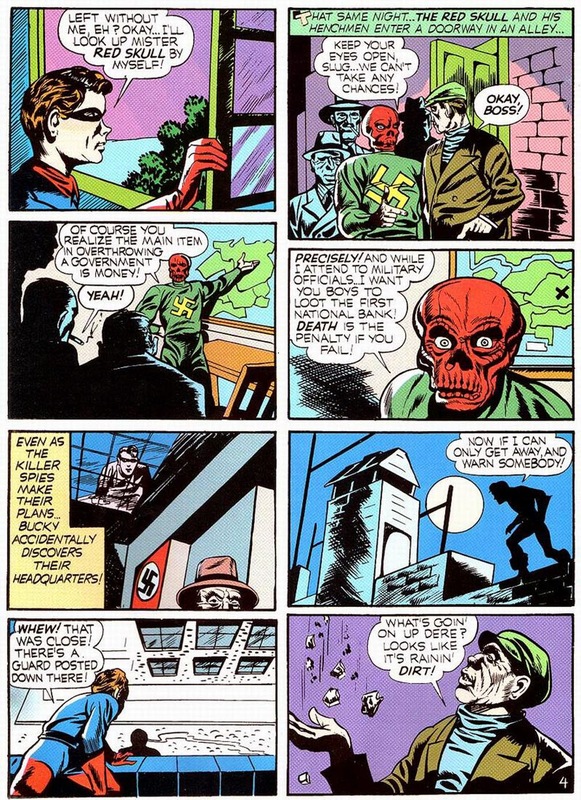 After experimenting with several nom de plumes like Jack Curtiss, Bob Brown, Ted Gray, Richard Lee, Curt Davis, and Lance Kirby, Jacob Kurtzberg finally decided on the name he would use for his comics career - Jack Kirby. 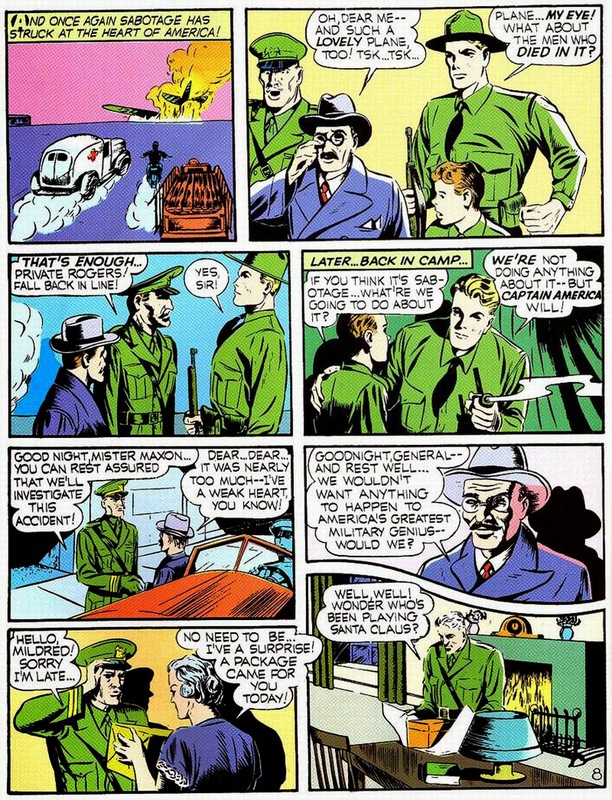 Kirby met Simon around March, 1940, while both worked for Fox Feature Syndicate. 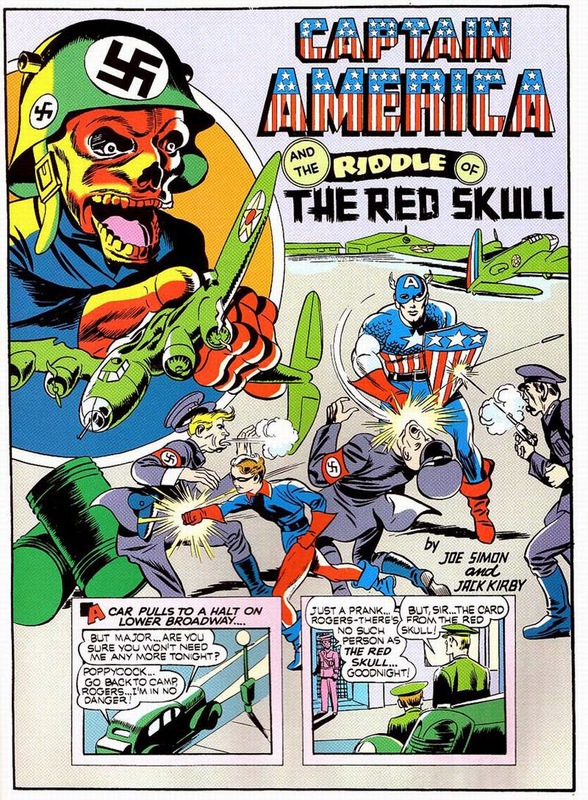 According to Kirby, "After Joe Simon was hired as an editor, we got to know one another and soon we were working together. Joe was a little older, and I counted on him to do the talking for both of us. We made a pretty good team." 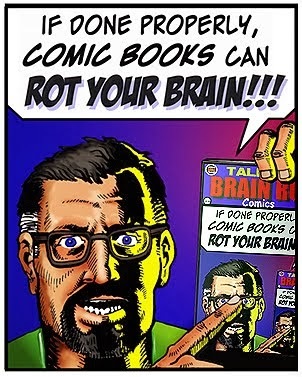 Soon after, both were hired by Martin Goodman at Timely/Marvel Comics. 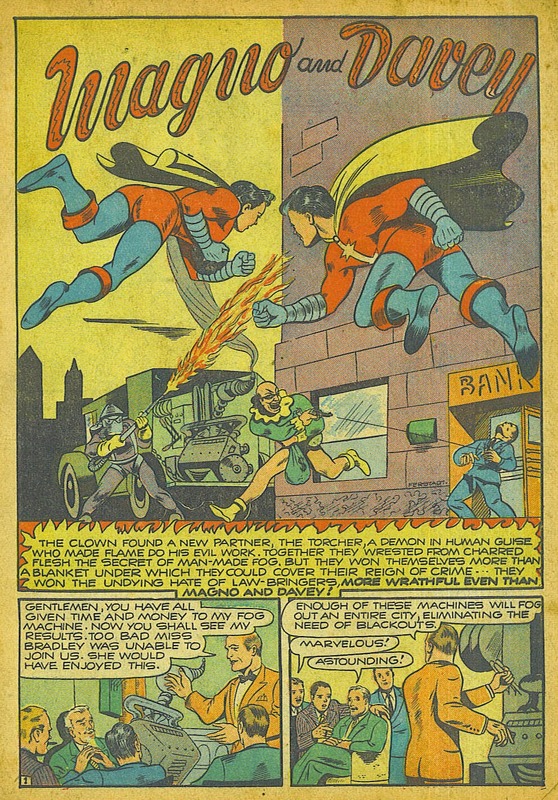 In 1939 Marvel had success with breakout characters The Human Torch and The Submariner. 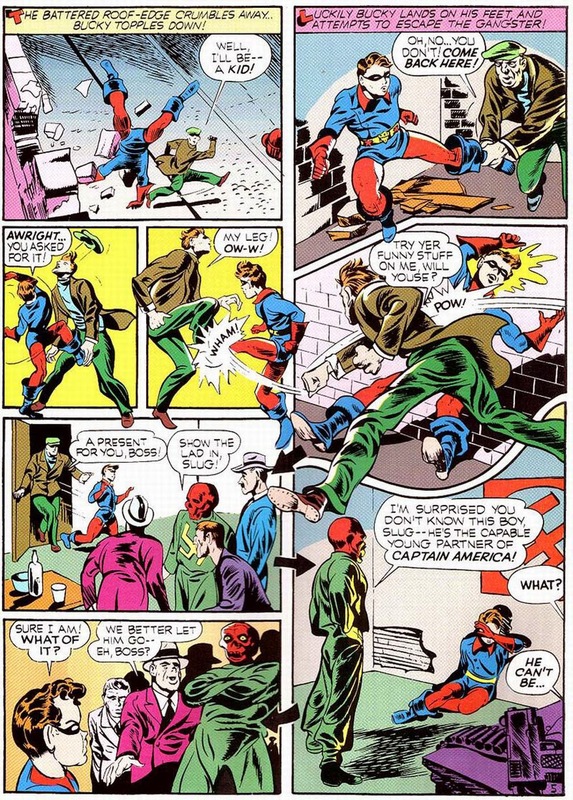 In December, 1940, CAPTAIN AMERICA #1 hit the stands, the right character for the right time. "The pressure was tremendous. I was penciling at breakneck speed, as many as nine pages a day. 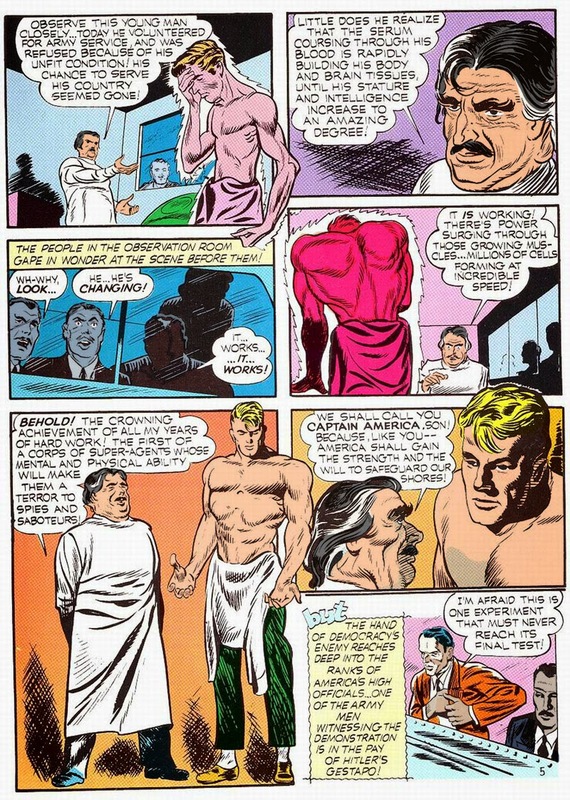 I guess that was the reason my figure work began to take on a distorted look; my instincts told me that a figure had to be extreme to have power. I feel that action and graceful movement symbolize beauty and life, and acrobatic characters are the perfect instrument to convey this. I want to show mankind at it's best, not it's worst." 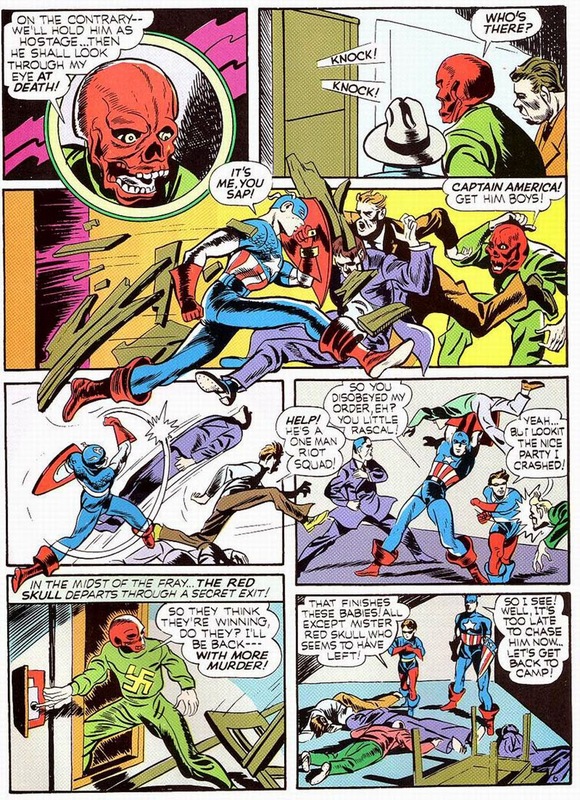 "Captain America was created for a time that needed noble figures. We weren't at war yet, but everyone knew it was coming. 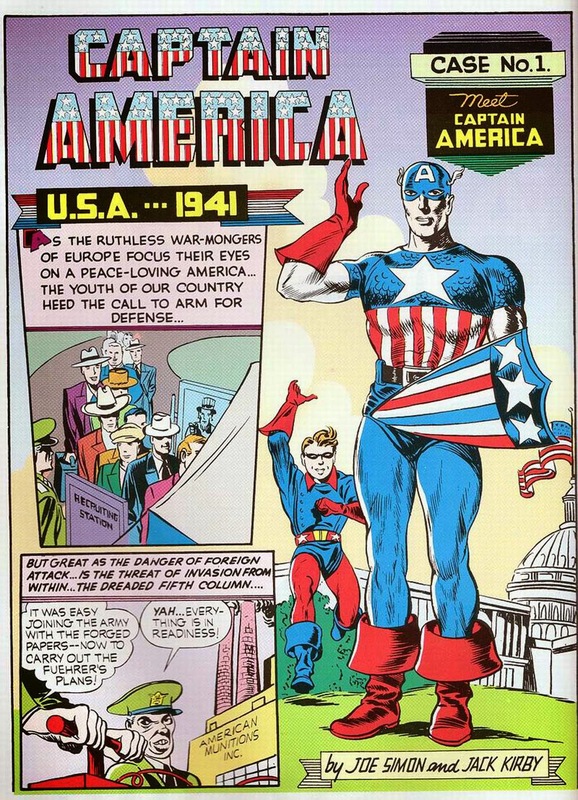 That's why Captain America was born; America needed a super-patriot." 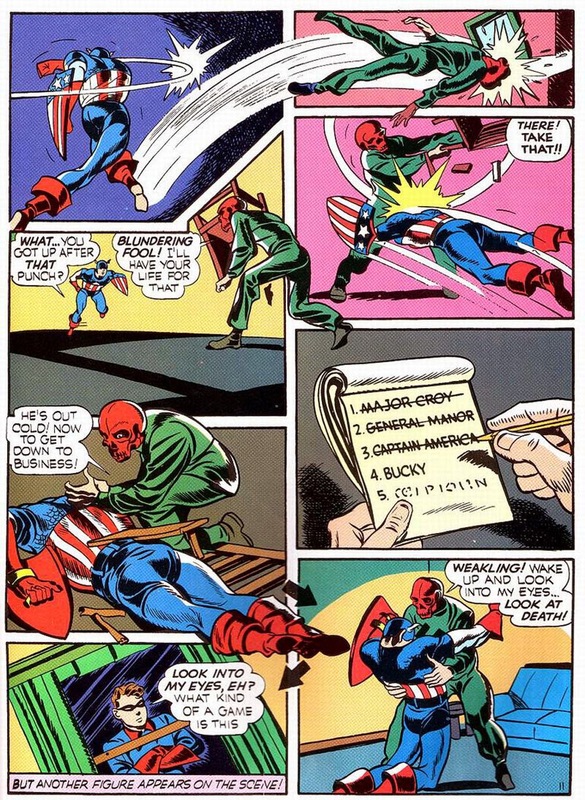 He was a super-patriot, all right. 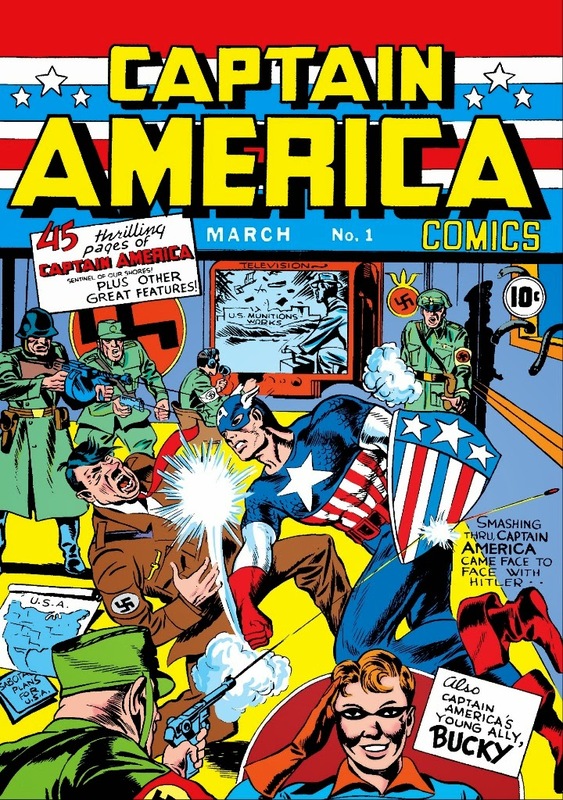 The cover for issue #1 showcased Captain America socking Hitler in the face! 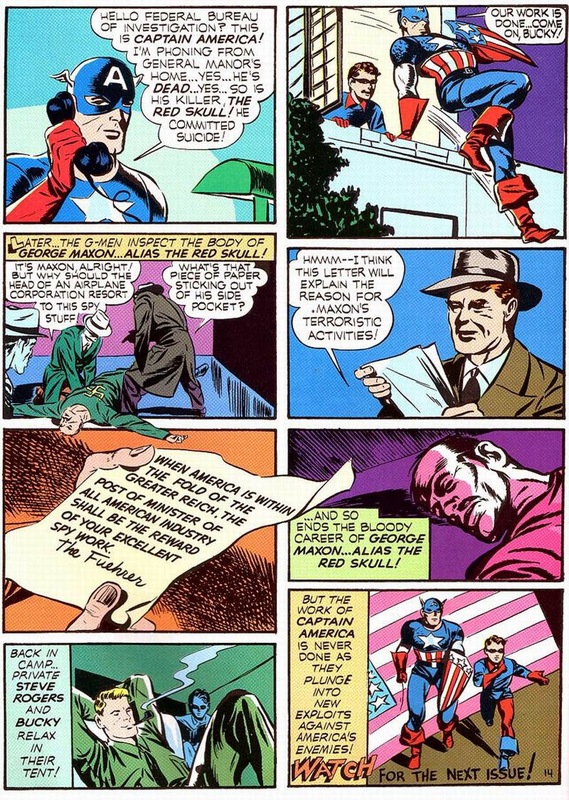 Simon and Kirby were first, and America would take the cue and follow Cap's lead.Within the year the United States entered the war and not long after, Hitler and his ilk suffered more than just a sore jaw. 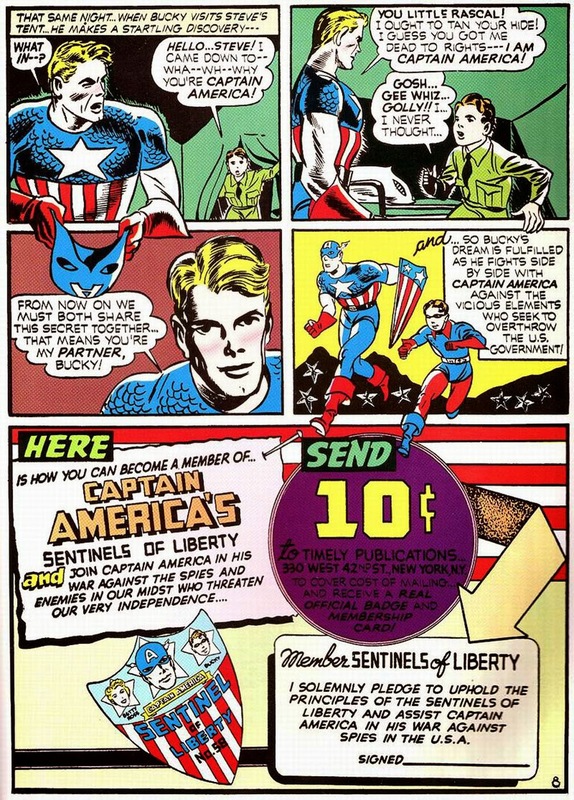 Captain America was there to lead the country to victory. 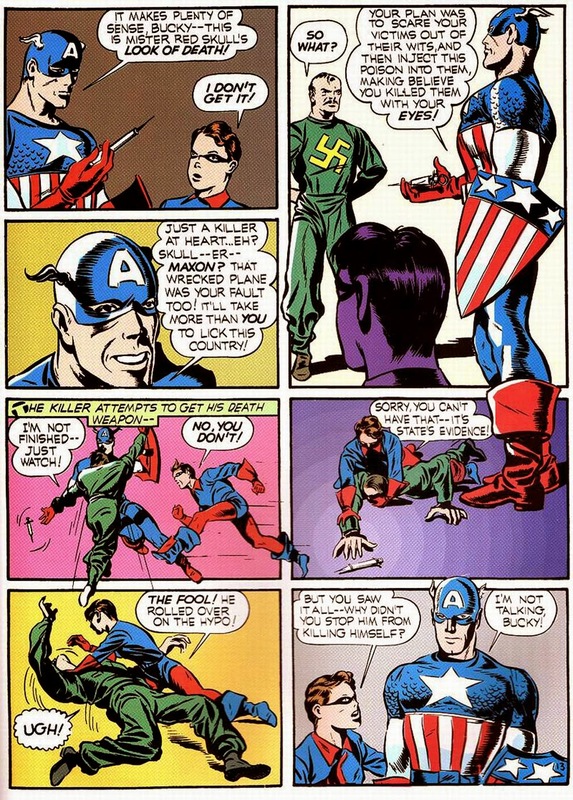 While today's political correctness prevents overt propaganda and the racial stereotyping that flourished during the 40's and 50's, it seems that the lines between right and wrong, good and evil have blurred to a degree where heroes like the Captain America of old appear trite, corny, and passe to the modern American. But I hope not. 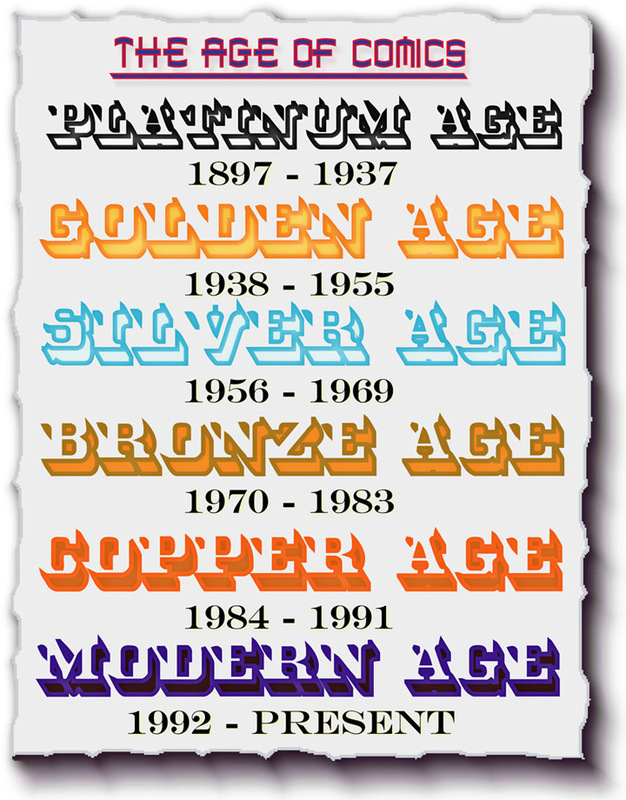 I believe that now as much as ever we need someone to look up to, someone to stand for decency and the moral values that are threatened to become covered in the dust of yesterday's forgotten history. 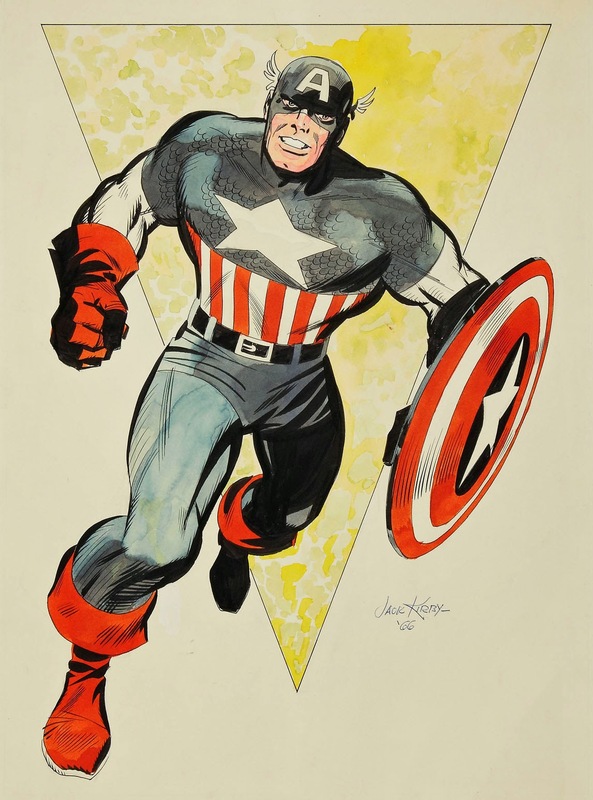 In a world of complicated trouble, we still need Joe Simon and Jack Kirby's simple vision of Captain America, the heroic national ideal worthy to be emulated, a leader for us all to follow. 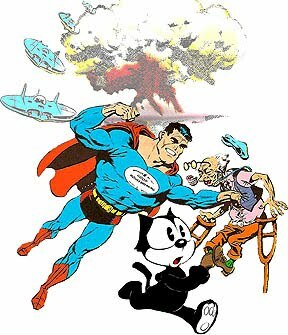 "We thought it would compete well with Superman. It was a good testing ground for me. 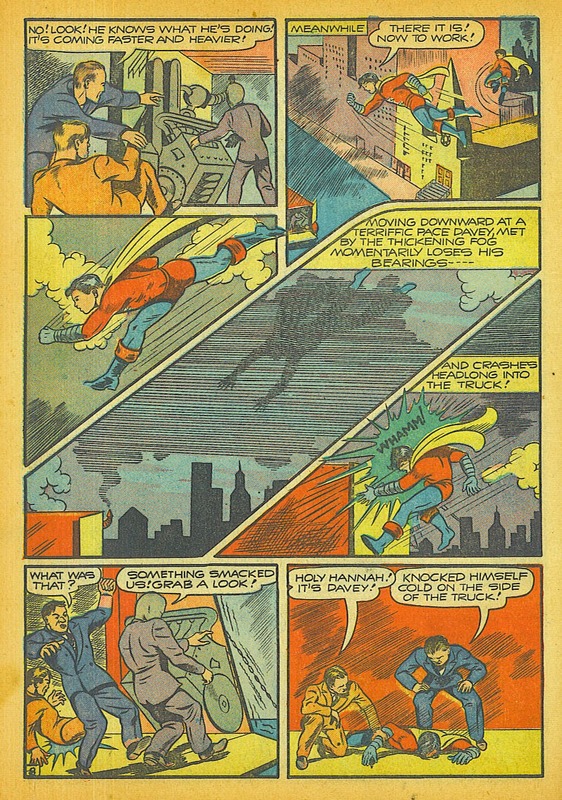 The first issue was meant to look more like a movie than a traditional comic book. Movies were what I knew best, and I wanted to tell stories the way they did. I guess I'm just a frustrated director." 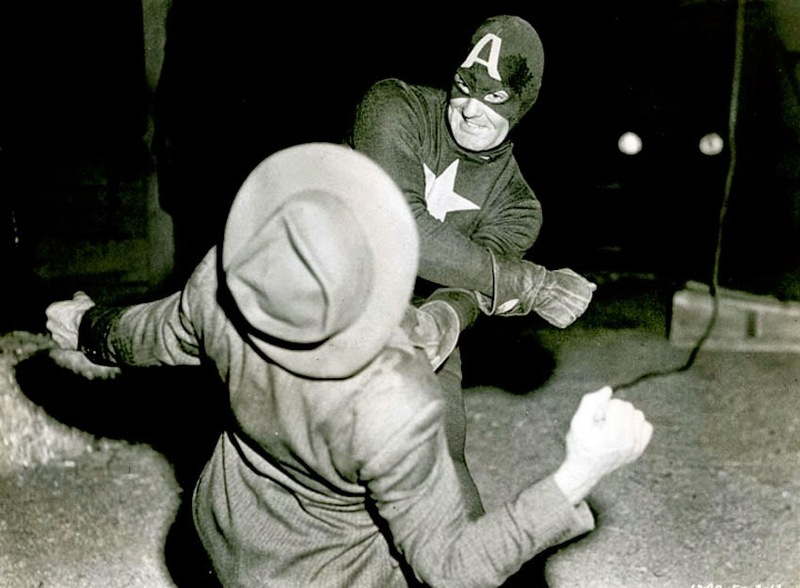 Captain America first appeared in the movies in 1944. 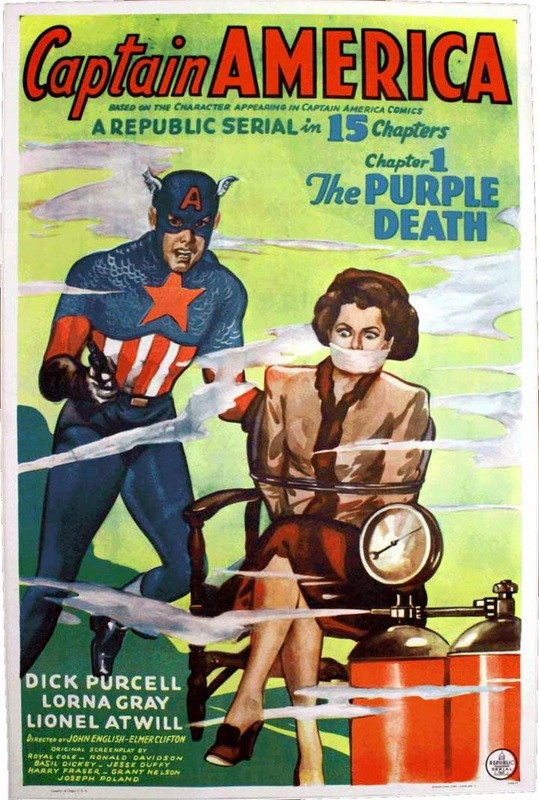 Timely/Marvel Comics publisher Martin Goodman gave Republic Pictures the rights to serialize Captain America free of charge. 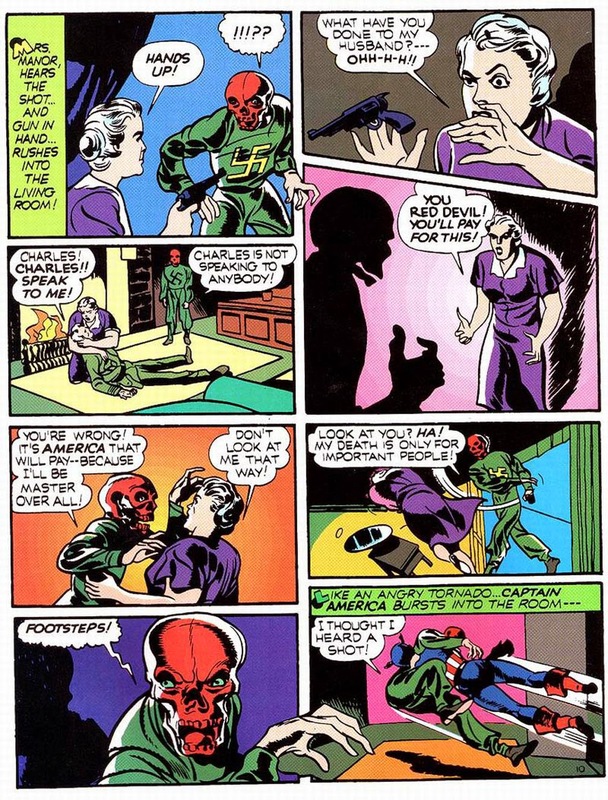 Creators Joe Simon and Jack Kirby "never got a dime" out of the deal.